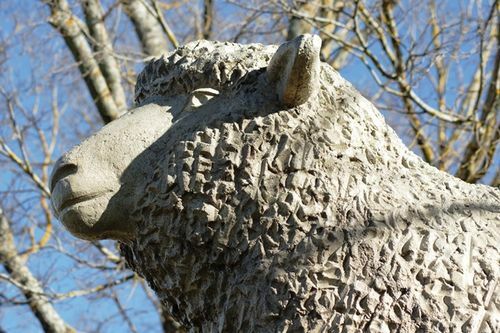 The Lamb and Potato Monument commemorates the region`s lamb and potato industries. A plaque was added to the memorial in 2003 in recognition of the founders of the Lamb and Potato Festival. In 1986, Royce Newbury and Frank Presnell, members of the Guyra Rotary Club, along with Joyce Sanders decided that the major products of Guyra, then being prime lamb and potatoes should be promoted with a week long festival to be held in January. The first Guyra Lamb and Potato Festival was held in January 1987 in Rotary Park on the New England Highway to catch the eye of passing holiday traffic and to coincide with travellers to and from the Tamworth Country Music Festival. Robert Gordon, Ron Leven, Jim Williamson.